This is one of my favourite photographs – mainly because it was taken in one of my favourite places: the Amazon rainforest. A place so utterly bursting with life that as the sun sets and the temperature drops, you can actually see the forest breathing. A thick snake of fog slithers its way along the rivers, while the canopy exhales steam which glows gold in the fading sunlight. I was lucky enough to spend a month in the tiny town of Rurrenabaque in the Bolivian Amazon, and this photo was taken on my second or third day there, as I began to fall deeply in love with my surroundings. I had wanted to visit the Amazon since I was nine years old – I drew felt-tip pictures of jungles, read up on wildlife, pored over maps and watched documentaries. And being there was every bit as enchanting as I’d imagined. 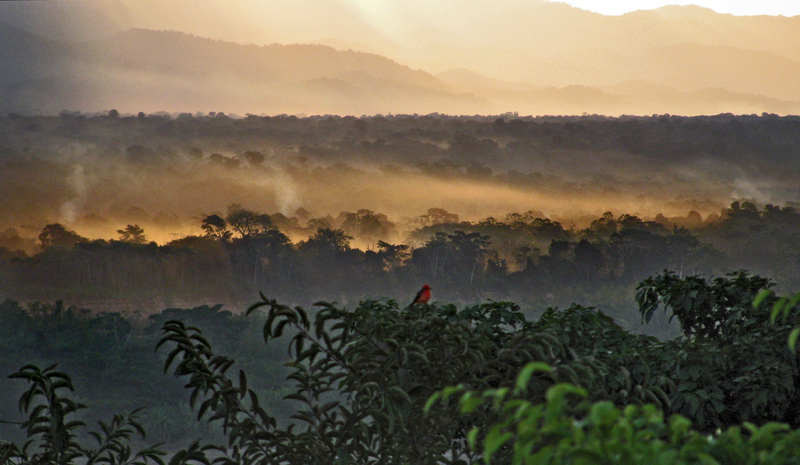 This was my second visit to the Amazon, and as I sat poised with my camera on a hillside just outside the town, gasping at the changes in light and mist, this little red bird came along and the picture was created for me. I find the “aliveness” of the Amazon to be infectious. The sounds of birds and cicadas and howler monkeys permeate dreams and thoughts; the smell of vegetation is like inhaling life; the jungle’s moist breath dampens my skin. I become more alive – I start to glow, my curiosity works overtime, I consume the jungle (the abundant fruits) and it consumes me (the persistent mosquitoes). I think this photo sums up the magic of the jungle, with the hot, damp breath rising up an indication of all the life that lurks beneath the canopy, and the little red bird a symbol of quite how beautiful that can be. Tags: Amazin, Bolivia, jungle, landscape, photography, rainforest, Rurrenabaque, south america, sunset, view. Bookmark the permalink.